Yam, is a word for a spicy Thai dish loaded with fresh herbs, fresh chilies, fresh veggies, with some protein mixed in. It sounds like a salad, but then when you take your first bite of it, you discover it’s way way more than just a salad. I adore the flavors in Yam Khai Dao: the zesty lime, crunchy onions, crisp carrots, crispy fried egg and spicy Thai chili pepper. Definitely the most fun, flavorful, while fairly simple, “salad” dish that I’ve ever eaten. 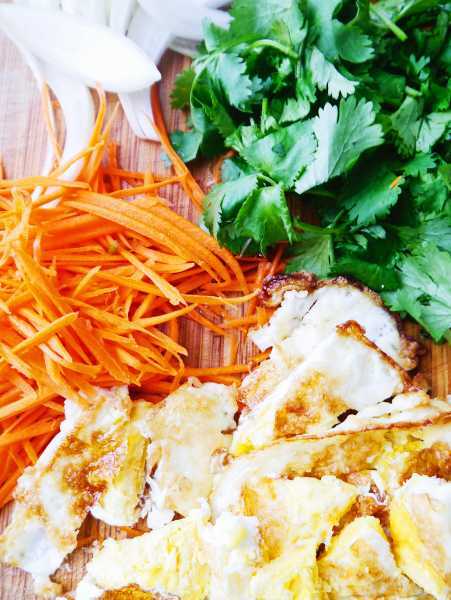 In Thailand, fried eggs are eaten alongside way more dishes than just breakfast ones, how awesome is that? One dish fried eggs match perfectly with is Krapaw Gai, which is what I served Yam Khai Dao along with. The fried egg pairs so well with the spicy food, soothing it out some while giving a lovely crispiness to a dish. I was flipping through one of my favorite Thai cook books, Pok Pok by Andy Ricker , which is where I saw the recipe for Yam Khai Dao, and realized I had never made it before, and it didn’t look too hard to master. Aka, a perfect Thai weeknight dish for me and you! Try it today to see what he is so excited about, and show me your creation on Instagram. Tag me @thaifoodie, I want to see!! 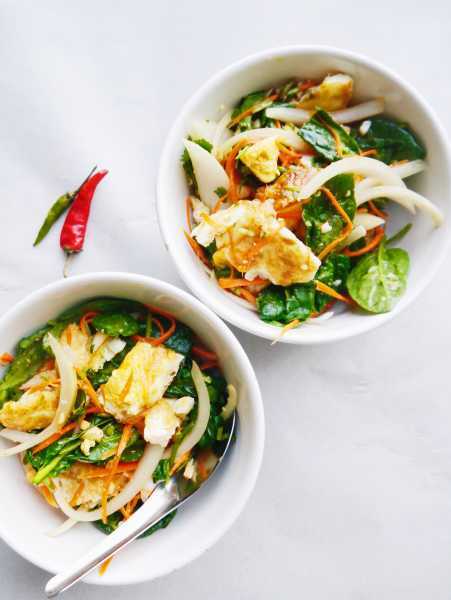 Spicy Thai Fried Egg Salad, perfect combo of fresh, zesty flavors: spicy Thai chili peppers, crispy fried egg, crunchy onion, lip-smacking lime and cool cilantro! 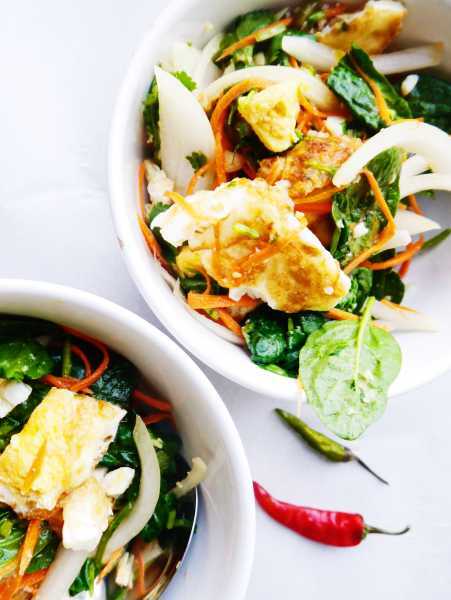 This super quick, Thai egg salad will rock your tastebuds' world! Warm the oil in a wok or frying pan over high heat. Once the oil is very hot and starts to smoke, crack the eggs into the pan close to the oil, and turn down the heat to medium-high. Let the eggs sit untouched in the oil for 1-2 minutes until the edges of the egg get really crispy, and the bottom of the egg golden-brown. Once crispy, flip the eggs over until the yolk is just set, should only take a minute or so. Slide the eggs onto a paper towel lined plate. Make the dressing by mixing the lime juice, brown sugar, fish sauce, garlic and Thai chilies in the wok over medium heat until the sugar is dissolved, about a minute or so. Turn off the heat. Cut the eggs into bite-sized pieces, and add them back to the wok along with the rest of the ingredients. Mix until all the veggies have dressing on it. 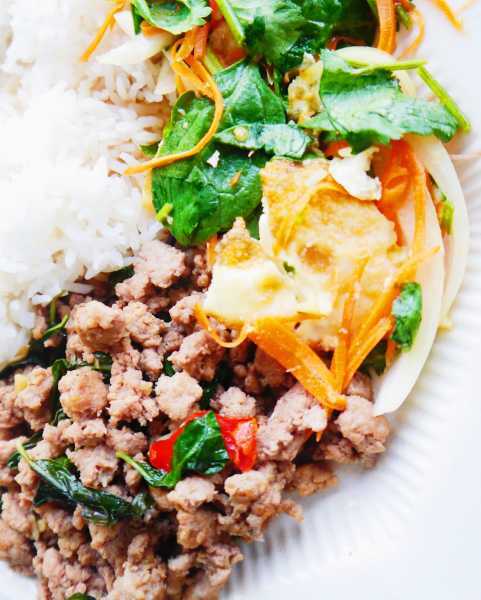 Enjoy with jasmine rice and dishes like krapaw gai!